Champagne is a sparkling wine named after the region of its production, based around the towns of Reims and Épernay in northeast France. 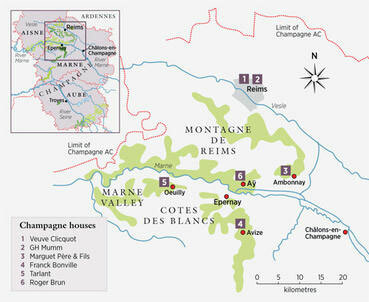 The three primary grapes used in its production are Chardonnay, Pinot Noir and Pinot Meunier. Other grape varieties are permitted but rarely used. ‘Methode Champenoise’ is the traditional method by which this sparkling wine is produced. Following primary fermentation and bottling, a second fermentation is initiated in the bottle by the addition of a liqueur de tirage. Non-vintage wines make up the vast majority of production in the region and are a blend of the latest vintage plus several older reserve wines. Non-vintage wines require a minimum of 18 months ageing before release. In years where there is an outstanding harvest, producers may ‘declare’ the vintage and make wines using only grapes from that particular year. A minimum of 36 months maturation is required for these wines. Are English sparklings closing the gap?